After a speedy five and a half hours from the beginning of final-table play, we have a winner here at Harrah's New Orleans. Jonathan Poche outlasted the field, taking home a first-place prize of $121,017. 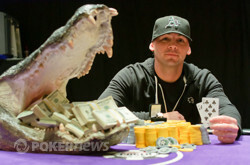 In addition, Poche has earned a seat in the WSOP-C National Championship to be held at Caesars in Las Vegas later this month. The final table was as by the book as can be. Except for two overcards beating a pair on a few occasions, the best hand held every time there was an all in and a call. Poche started the final table sixth in chips with 656,000 and thanks to a few won races and best-hand holds, he rose to the top. With seven players left, Poche doubled with against Jacob Bazeley's to give Poche a seven-figure stack. Shortly after that, Billie Payne shoved a 13bb stack with . Unfortunately for Payne, Poche woke up with in the big blind. Another big hand in the big blind worked well for Poche with five players left as his held against Scott Zakheim's . The key hand for Poche came with three players remaining when he was the short stack.. His defeated Josh Evans' when an ace hit the flop. 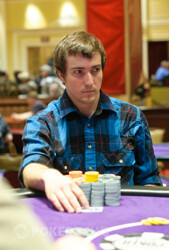 The next hand he eliminated Evans, leaving Bobby Toye as the lone opponent standing in his way. Heads-up play began with both players having nearly identical stacks, but they would only go one direction from there. Poche dominated his opponent with relentless aggression, including two four-bet shoves that really lopsided the chips in his favor. It wasn't long before Toye shoved with and ran into Poche's . As was the case for all the dominating favorites at the final table, the best hand held up and the title was clinched for Poche. That concludes PokerNews' coverage of the Main Event here at Harrah's New Orleans. Congratulations to Jonathan Poche and be sure to join us as tomorrow as the $10,000 WSOP-C Regional Championship kicks off at noon local time. Until then, good night from New Orleans! Bobby Toye moved all in for about 860,000 on the button and Jonathan Poche called immediately with . Toye tabled and was going to need help to keep his hopes of winning alive. The flop came down , no help whatsoever to Toye. The turn card did give Toye few outs to a chopped pot, but the river river was not one of them, bringing the tournament to an end. 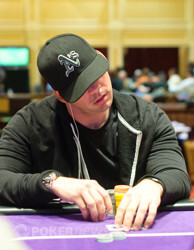 For his runner-up showing, Bobby Toye earned $74,783. It's another pot to Poche. This one started with Bobby Toye opening to 150,000 and Poche defending his big blind. The two men checked through the flop, and the landed on fourth street. Poche took his cue to bet 185,000 at the pot, and Toye made the call to see the final card. It was the to double-pair the board, and Poche fired out again with 285,000 chips. Toye under-raised to 550,000 (? ), and Poche quickly called with . It was good, and Toye's muck forces him all the way down to about 1.1 million. Jonathan Poche loves his four-bet shove. He opened to 175,000, and Bobby Toye reraised to 500,000. He'd not get those chips back as Poche shoved over the top to coax a fold. 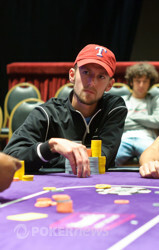 Toye is down to 2.64 million now as Poche has opened a two-to-one chip lead. The heads-up match began nearly even in chips, but Jonathan Poche has begun to open up a small lead. On the last hand, it was he who opened to 185,000 from the button, and Robert Toye reraised to 550,000. Poche shoved all in, and the crowd rose to their feet. Toye surrendered, though, and he'll drop to 2.94 million. That gives Poche the other 4.7 million chips and a decent edge in this match. On the next hand, Jonathan Poche shoved from the small blind, and Josh Evans called all in for 235,000 from the big. He was working with , and Poche's was ahead with a chance at the knockout to bring the match heads up. The paired both men to keep Poche in front, and the turn left Evans dead to five outs. The river wasn't one of them, and Evans has run out of chips. He's been sent off in third place, good for more than $50,000. On Hand #101 of the day, another big pot broke out. It began with Josh Evans opening to 180,000, and Jonathan Poche's answer was a three-bet shove for 1.775 million. Evans made the call, and the two men were close in chips as the cards were tabled. The flop was just what Poche was looking for, pairing up to take a commanding lead with two cards to come. The turn was a blank, and the river meant no change, either. With Big Slick doing the work, Jonathan Poche has doubled up to 3.65 million. When the stacks were counted down, Evans was left with just 250,000 lonely chips with which to try and mount a comeback. The players are on a break, so here is an update on their stacks.